In the midst of swirling and slurping, it’s easy to forget that wine is a major industry in Washington. 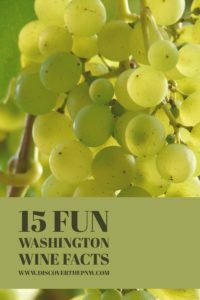 So pour yourself a glass of your favorite Washington wine (and share what it is in the comments), and have a good time with the fun Washington wine facts. Washington is home to over 900 wineries, making it the second largest premium wine producer in the country. California is first. Premium wine is defined as that sold for over $8 per bottle. Over 16 million cases of wine are produced each year, representing over 40 varieties of wine. Washington grapes are 58% red and 42% white. The top red grapes planted are cabernet sauvignon, merlot, and syrah. The top white grapes planted are chardonnay, riesling, and sauvignon blanc. The economic impact of the Washington wine industry is over $5 billion per year. Although we tend to think of champagne and France when it comes to the bubbly, Washington also makes sparkling wines. But don’t call it champagne, which by law must come from the Champagne area of France. Washington also produces fortified wines, although this type of wine is often associated with Portugal where it was created and perfected. Adding branding or other spirits during the fermentation process creates these high-alcohol content dessert wine. You may see some wineries using the name “Port.” Those wineries using it are grandfathered in as to the use of the term, although are being encouraged to change the name. No new usage of the term is permitted. There are eight generally accepted wine touring regions: Seattle and the Northwest (which includes much western Washington), Woodinville, Columbia Gorge and the Southwest, Cascade Valley and the North Central part of the state, Yakima Valley, Tri-Cities (Richland, Pasco, Kennewick) and the Red Mountain area, Walla Walla Valley, and Spokane and Pullman region. Hydrating is an important part of wine tasting. Drink plenty of water between tastes and always have a designated driver. Wine events are scheduled in all 12 months of the year. Big events include Taste Washington Wine Month (March), spring barrel tasting (April-May), Washington State Wine Month (August), crush (October), and fall barrel tasting (November). For most food and wine pairings, a good rule of thumb is to match the intensity of the food with the intensity of the wine and don’t be afraid to experiment. If you like something paired together, that’s all that matters. For example, red wine and chocolate is not a natural pairing, but if works for you, sip up. We tend to drink most red wines too warm and most white wines too cold. Ideal serving temperatures for most red wine is 63-65 degrees, for lighter white wines it’s 48-53 degrees, and for full-bodied white wines, it’s 54-58 degrees. Sparkling wines should be served at 40-45 degrees. Wine glass selection has become more about aesthetics than about wine tasting. In general, both white and red wine can enjoyed in a stout, relatively small and skinny glass, with a short stem, and an egg-shaped bowl with a base larger than the opening. Wine should be poured to no more than a third of the glass, allowing room for swirling. This is the standard glass and pour used for expert tastings and competitions. Flutes, with a small opening, are best for sparkling wines. Red wines get lighter with age and white wines darker. Extremes on either end of the spectrum, however, may indicate a spoiled bottle. For many wine experts, their favorite Washington wine is the one that happens to be in their glass at the time you ask. What’s your favorite Washington wine? Mary Jo Manzanares is a luxury travel and lifestyle blogger, podcaster, and avid traveler. Mary Jo Manzanares writes about value luxury destinations and experiences for baby boomers at Traveling with MJ, is the founder and the editor-in-chief of The Travelers Way, providing practical travel information and tips, is the voice of the Where Else to Go podcast (available on iTunes and Google Play), chronicles her quest to visit every winery in the state of Washington on Seattle Bits and Bites, and is the editor of The Yums, featuring restaurant reviews from around the world. She is a frequent speaker at travel industry events. Mary Jo lives in Seattle and when she’s not traveling you’ll find her lingering over a cup of coffee, wandering in a museum, or sipping wine at a cafe.